For the pilgrim the landscape of Avalon is a treasure trove where sacred sites abound. 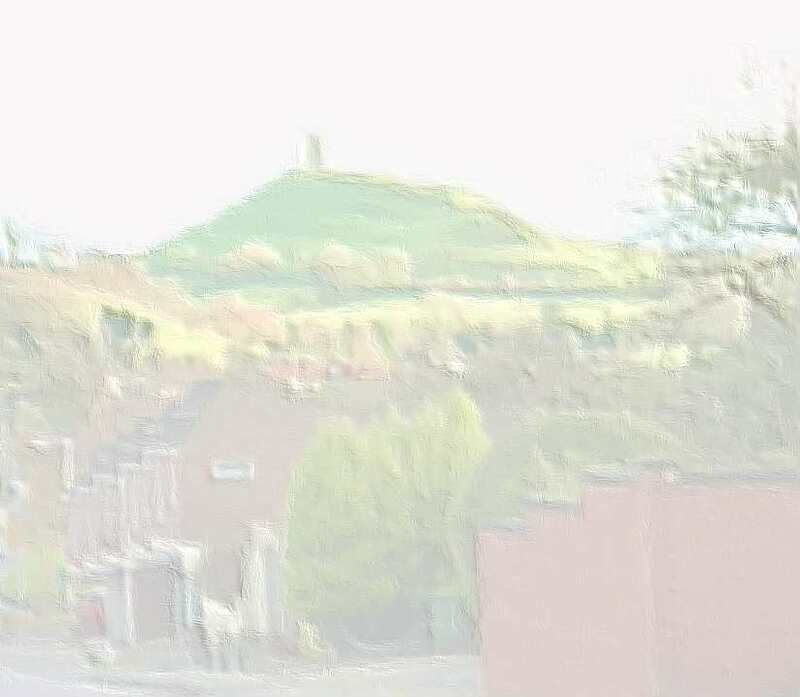 The most obvious to the visitor is Glastonbury Tor which can be seen from a great distance rising enigmatically above the flat Summerland meadows. There are many myths and legends associated with the Tor  it is the home of Gwyn ap Nudd, the Lord of the Underworld and King of the Fairies, and a place where the fairy folk live. In early-medieval times there was a small monks' retreat on top of the Tor, founded probably in the time of St Patrick in the mid-400s. This was followed in the early 1100s by a chapel, St Michael de Torre. This was destroyed in a powerful earthquake in 1275 and rebuilt in the early 1300s. The tower is all that remains today. In recent years there has been discussion about the significance of the terracing of the Tor. 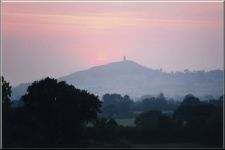 It was proposed first by Geoffrey Russell and then expanded on by Geoffrey Ashe, the well-known Arthurian scholar, that the terracing on the slopes of Glastonbury Tor is the remains of a great three-dimensional neolithic labyrinth, a ceremonial way dedicated to the ancient British Goddess. Whether it will ever be proved that the labyrinth was constructed in the Neolithic era or not is a matter for future archaeology, but since it was first suggested many thousands of people have walked it in a sacred manner. And this is no mean feat since it takes from 4-6 hours and some physical exertion and inner focus to walk in and out of the labyrinth. It provides the perfect setting for a present day ceremonial journey, whether it was so or not in the past. If the terraces were not built as a labyrinth, it does seem to have been built for ceremonial, sacred or geomantic reasons. 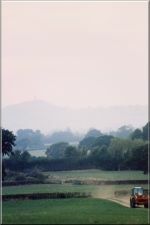 The only remaining reason, agricultural terracing, makes little realistic sense, even though the National Trust and many archaeologists continue to believe it  Avalon had well enough land and sunny slopes for special crops such as grapes, and the terraces stretch around the sunless and at times very exposed side of the Tor, hardly suggesting farming use. The Tor is now owned and cared for by the National Trust and there is free access to the public at all times. To see the NT conservation policy for the Tor, including its natural history, click here. Some flint tools found, a greenstone axehead buried on top of the hill  probably a votive offering. The terraces around the Tor may have been set up as a labyrinth for some sacred purpose  no proof as no terrace has been excavated or dated. No evidence of stones or structures at top of Tor. Few finds in early period  some small finds in Roman occupation period (the Romans or Romanised British used Glastonbury as a focus of several trade routes and may have had an agricultural centre, like a villa, near the present Abbey site). After the Romans left the hill was settled by a small group of people in rough huts during the period around 450-55 AD. These were probably Celtic hermits but could have been a small garrison for one of the local Celtic kings. 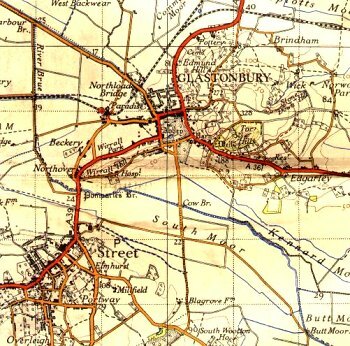 In the late Seventh century the newly Christianised Saxons took Glastonbury and upgraded the Christian settlement there. The earliest Abbey remains date from this time, and the Tor was settled by Saxon monks or hermits, two small cells, a possible chapel and a cross-head were found. The Tor top was levelled at some point in the 900s or 1000s to build a large stone church. This removed much archaeological evidence. In 1275 this church was felled by an earthquake. It was rebuilt smaller in 1323 and lasted until the death of the Abbey at Henry VIII's hands in 1539. The church was quarried for stone. The tower was repaired and is now in the hands of the National Trust. Thousands visit it every year for as many reasons! 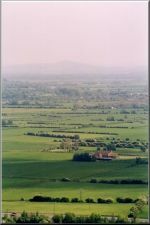 Glastonbury, Philip Rahtz, English Heritage/Batsford 1993, ISBN 0-7134-68661. This book is good for documentary and archaeological details. Glastonbury Tor, Nicholas R. Mann 1993, Triskele Press, ISBN 0-9510682-1-0. This book has a good summary of local legends relating to the Tor. The Glastonbury Tor Maze, Geoffrey Ashe, 1979/2001, Gothic Image Publications, ISBN 0-906362-01-6.